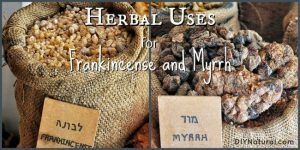 Both frankincense and myrrh have been used in herbal science for ages. The time of Christ is said to be around the year 5 BC, and both of these have been used for centuries even beyond that. Both frankincense and myrrh are resins – hardened sap from trees. 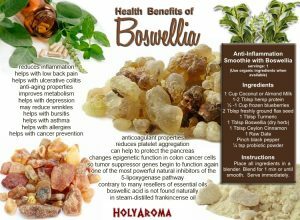 In both cases, trees are slashed and allowed to “bleed.” The sap that comes from the trees hardens and forms beads or “tears.” While frankincense is used for incense and myrrh is mainly used in oral preparations, they both have many more uses. Frankincense is used as an aid in digestion. It can be chewed like gum or steam distilled. It can also be made into a tincture and taken as needed. Frankincense has also been used for arthritis. The tears can be infused in oil and made into a salve. Both frankincense and myrrh have been used for centuries as incense. They have been burned and laid on charcoal to smoke. Both have also been used in mummification and preparing bodies for burial. The antibacterial properties of both compounds may help to purify the air and aid in preservation in both cases. Myrrh has been used for female problems including menstruation issues, menopause and uterine tumors. Like Frankincense, myrrh has also been used for arthritis. Myrrh has long been used for oral treatments. It decreases inflammation in the mouth and can kill bacteria. This makes it a great aid in mouth ulcers, tooth problems and other oral issues. 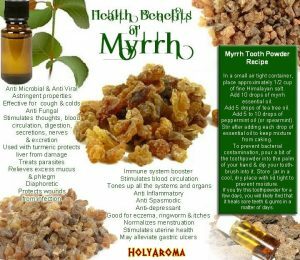 Myrrh has also been used for hemorrhoids, possibly due to its anti-inflammatory properties. More recent time has shown cultivation of frankincense and myrrh trees to be on the increase. While wild plants are diminishing, cultivated plants are increasing. The natural region they grow in is Africa and surrounding areas, but research has shown that they can be grown in greenhouses around the globe. There are several trees (or more shrubs, as they are) on display at botanical gardens around the world.